With the arrival of hot summer, 109th Canton Fair, a regional event of international trade which is famous for its large scale and high volume of business kicked off in a heated atmosphere. For years, Canton Fair has been an important bridge for the communication between KTC and the clients, a good platform for KTC to show its excellence and more of a main channel for both old and new clients to know about KTC. Therefore, each year great importance was attached by KTC to the event. On the Canton Fair, the Company has taken great pains to create a good effect no matter in the size of booth, arrangement of booth, the products to be shown or the service offered at the show area. Walking into the show area of KTC, what came into sight first was the dual-layer fantastic structure of the booth, the largest ever in Canton Fair; the marvelous 3D TV wall was very shocking, which was also a highlight at this event and caught a lot of eyes from the visitors; what’s more, the large delegation since the history of our participation in the fair was dispatched to this event, making full preparations for the service at the show. All of these reflected the ceaseless pursuit of KTC for high quality, which has won praise from clients in different scales. In the interview, all of the staff said, the work of preparation and move-out was hard though, they felt sweet in heart when finding such good effect achieved. During the interview, the considerate service and well-prepared candies and dried beef by the serving staff have pleased the clients and visitors a lot. 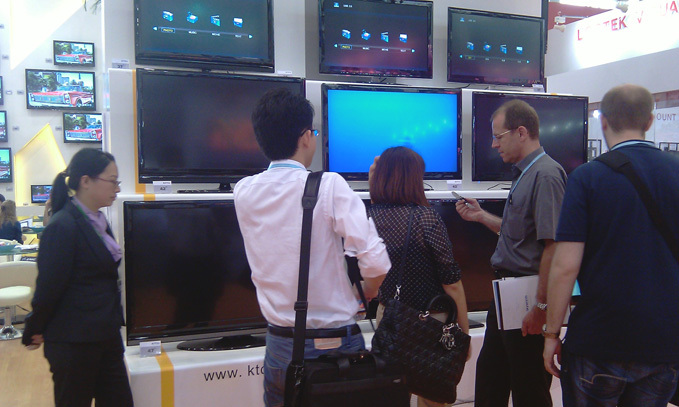 It’s reported that on this fair, KTC mainly showed 3D TV and LED TV, targeting at high-end markets. During the show, a lot of clients were attracted by the fantastic 3D TV wall. Meanwhile, LED TVs of KTC were beautiful in appearance and various in designs. And the models also caught a lot of eyes. Most of the time, at the tables was full of visitors while clients kept coming outside the booth. 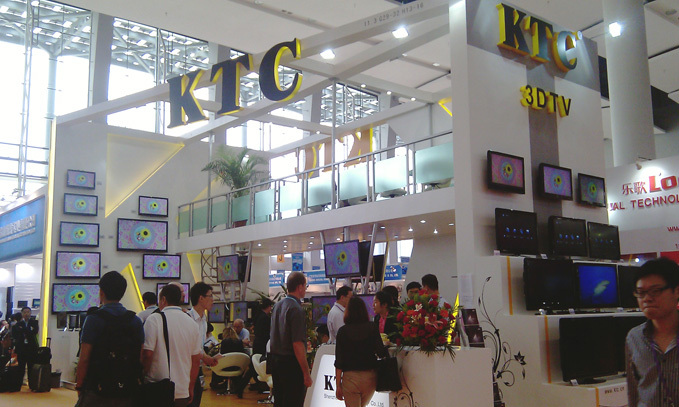 The 3D TVs shown by KTC not only boosted the atmosphere of show area, but also reflected the excellence and leading strength of KTC in production of 3D TVs. These years, KTC has put a lot of investment into the research, development and production of 3D TVs, which has made a lot of achievements. 3D TVs produced by KTC were reasonable in price, which can be said to be the most competitive in the world; meanwhile, the quality is fantastic, reflecting the great power of KTC to compete with large factories both at home and abroad. 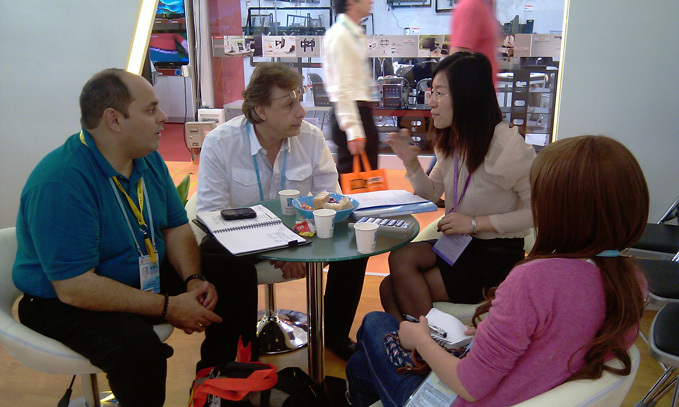 A lot of professional clients have been attracted by the 3D TVs exhibited. It can be said that the 3D TVs produced by KTC were extensively recognized and praised no matter in quality or in technology. According to Manager Liao of Foreign Trade Department, the overseas 3D TV market is still in the initial stage. However, opportunities only knock at the door of those who have got well prepared. The efforts of KTC in 3D TVs has already got KTC take the lead in the industry, which reflected the acute sight and courage of the company’s leaders. We are fully convinced that as long as we kept perfecting, progressing, the spring of KTC 3D TVs will be coming soon.